While it’s definitely easier and faster to post photos to Instagram, for some reason it doesn’t automatically generate a complete blog post here simultaneously. Possibly because WordPress is a completely separate entity. So you’ll have to pay attention to two different locations to get a more complete picture of what’s going on. I’m sure you can handle it. Enough of that. You’ll have seen this first photo already, I suspect. Bass body in a vise, after rasping most of the edges. For those of you who might be trying this at home (side note – don’t try this at home) an electric drill won’t turn the rasp fast enough to really do anything. Both the air-starved die grinder and the drill will spin the rasp, but once you apply it to the work, it bogs down so as to be practically unusable. So we went back to the hand rasp. It really works pretty well. A high-quality rasp would likely do better. And gloves might help, but so far there isn’t any rasped-off bits of skin or fur embedded in the work. 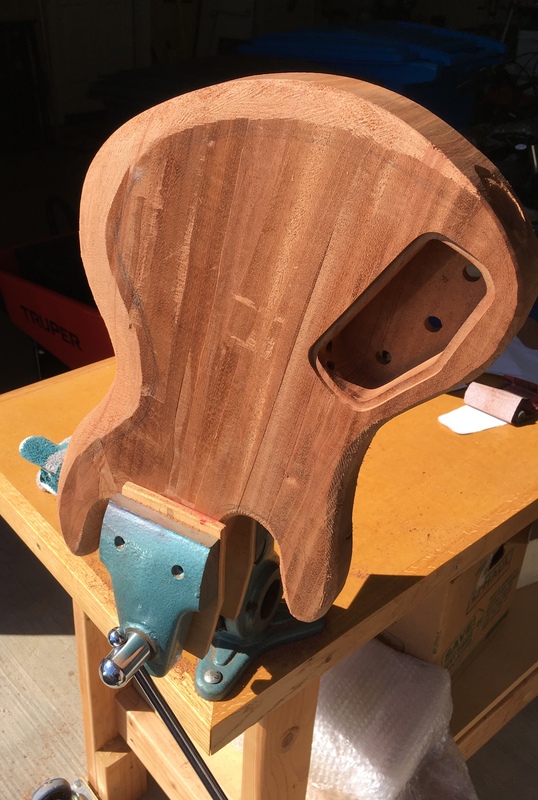 Same body, front view, after sandpaper shaping is mostly done. After rasping, some more shaping was done with 60-grit sandpaper and blocks and contour sanders. This isn’t the final shape, but it’s reasonably close. The lower bout bass side (that’s the bit nearest to you on the right in the photo above) has a hard edge where it drops off vertically, and I think that will get rounded over. Looks neat, but I suspect it’ll be uncomfortable in the long run. And it’s the only sharp edge on the body, which makes it look out of place. Esthetics are important, or so I’m told. There were several ridges on the front and back from using a power planer to thickness and smooth the body. Some are more visible in the first photo above. Most of these were removed with a block plane and sandpaper. 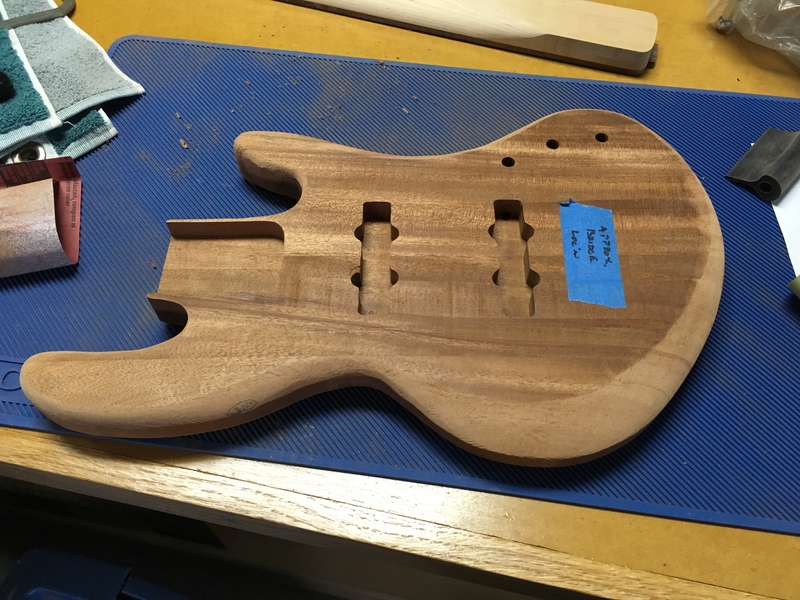 This entry was posted in In Progress and tagged Bass by slumco. Bookmark the permalink.